When you are running a wedding planning business, to say you have a lot of responsibility would be an understatement. Because, in addition to making sure that your clients’ weddings are picture perfect (and the million tasks, emails, meetings, and phone calls it takes to make it happen), you have to make sure that your own business operates like a well oiled machine. Today, then, we wanted to talk about how we stay on top of it all at LVL Weddings & Events. Specifically, how we use Honeybook’s online business management software to book clients and stay organized through it all. Read on to find out what our favorite tools are and how we use them in our own wedding planning business! Whether you have 5 active leads or 50, making sure that you are moving things along at a timely pace can be a challenge. And, one of the reasons we love Honeybook is because of how their lead management system helps the LVL team stay organized and on top of each lead. Proposals are an important part of the booking process for wedding planners, but they also tend to be very time consuming to put together. Not with Honeybook! Now, we can customize and send proposals to potential clients faster than ever before – which is great since couples expect short turnaround times. As a business owner, making sure the books are well managed and that payments are being received on time is an important task to oversee. And, chasing down payments or sending reminders to yourself to send reminders to clients about upcoming balances due is just not a viable solution. Using Honeybook to send invoices and receive payments online has been great for our business and has helped me be a better CFO! Did you know? HoneyBook has an in-house team managing all payments processed through the HoneyBook platform. They keep all your financial information safe and secure with 2 Factor Authentication and monitors all payments for fraudulent activity. In the case that any credit card payment made to you is disputed, HoneyBook will advocate on your behalf and be there every step of the way to guide you through the process. This means you can spend more time working on what you love and less time worrying or fighting for your pay-check. 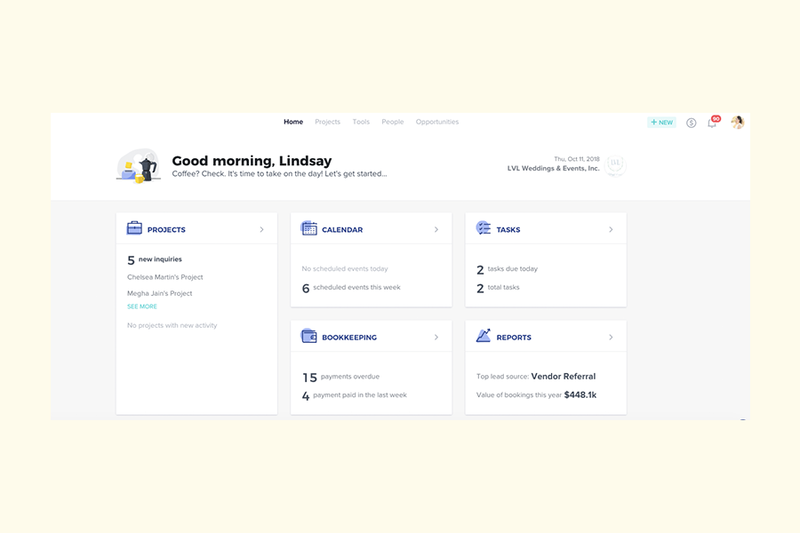 Using Honeybook’s online business management software has helped us be more organized and scale without having to add more people or systems to our plate. Want to streamline your own wedding planning business? Use the code lvlacademy or sign up through this link to get 50% off your first year!